Physical Characteristics – A robust, evergreen perennial herb, and member of lily family. Leaves are wiry, and grass-like, which grow in large clumps. Leaves reach 20 – 60 cm in height, while its flowering stems grow from 50 – 150 cm. These produce bottle brush-like clusters of small, fragrant six-petaled white flowers. Habitat – Found in dry, open sites and occasionally in forests on mountain slopes. More common in montane and sub-alpine zones throughout the Clearwater. Range – Southeastern British Columbia and southwestern Alberta, and portions of Idaho and Montana. Reproduction – Flowers from May – August once every 3 – 10 years. Usually all plants in a population bloom together, covering slopes with fragrant, white flowers. Beargrass thrives on periodic burns, and sprouts quickly in scorched areas. Threats – Some population disturbance from leaf harvest by the floral industry. Misc. – Earns its common name because bears eat the leaf sheaths in springtime. Mountain goats will occasionally eat leaves during the winter. 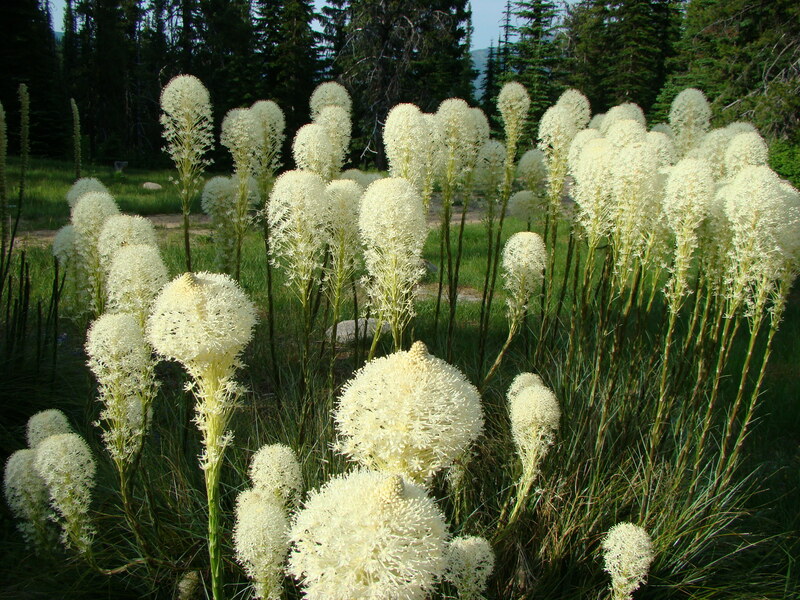 Flowers and young seed pods are also eaten by elk, big horn sheep and other mammals. Some Native Americans use the long, tough leaves for weaving.